As I mentioned in the blog entry “A Skeptical Introduction to Bodybuilding Supplements”, I’m a fan of protein and believe that while a well-rounded diet provides sufficient protein for most people (about 0.4g/lb. of body weight per day), intense workouts with the goal of building muscle requires supplementing with this refined food (to about 0.8 g/lb. of body weight). Oddly, this isn’t very controversial among people trying to put on muscle – I haven’t actually met a bodybuilder who questions the use of protein (there is a lot of debate and questionable claims around most other supplements). My first question is always about protein supplementation, because without the fuel you simply won’t build the muscle. There can be all kinds of other potential issues, but intake is a good start. What do I take and where do I buy it? Remember Little Miss Muffet’s curds & whey? I suspect Little Miss Muffet was ripped, because whey protein is used by most bodybuilders as a key element of building muscle. Whey is a derivative of cow’s milk and comes in several forms, with the most convenient and economical being powder. Unless you are vegan or severely lactose intolerant (it’s low lactose, but still lactose), whey is the way. For the purpose of this blog I’m going to limit the scope to the most popular types of protein powder (I’ll tackle other protein types in another blog). Protein powder varies widely in price, is often mixed with other additives including creatine, caffeine, flavoring, various carbohydrates, extracts, essences, or magic potions in super-secret-proprietary proportions. They are almost always accompanied by extraordinary claims like “Improved flavor!” (which means it tastes terrible but formerly tasted worse), “Build Muscle FAST!” (Disclaimer: intense exercise not included), “Get Ripped QUICK!” (Disclaimer: intense exercise not included AND don’t expect to eat anything else). Concentrates: Refined to reduce most carbohydrates, fat, cholesterol, sugars, etc. and give you somewhat pure protein. This is the least expensive and most popular form of whey powder, with consistency similar to baking flour. Usually ~50% protein. ~$10/lb. Isolates: More refined than concentrates but more expensive with the consistency of table salt. As much as 90% protein. $11-12/lb. Hydrolysates: Whey isolates chemically altered to break down the protein compounds for faster metabolization. Similar purity and consistency to isolates with a premium price as this is purported to be the most efficient way to ingest your protein. $15-16/lb. More MUST be better… right? Manufacturers play marketing games – as in ANY industry. 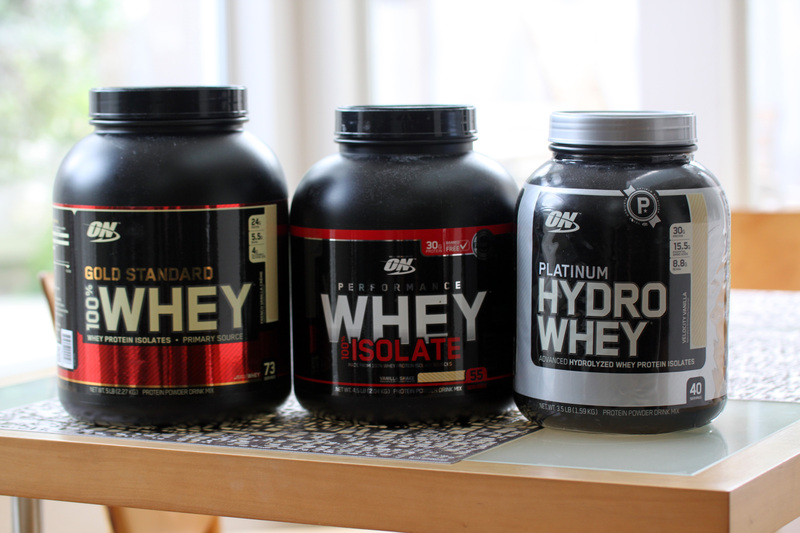 For example, check out the picture below of 3 different whey protein products from Optimum Nutrition. Note: I don’t endorse these products and use them here only as being representative of popular products in the industry. The first is their low-end “Gold Standard” product offering 24g of protein per serving, the second is a more refined “performance” whey Isolate offering 30g per serving, and the third a “platinum” hydrolyzed version of the whey isolate also offering 30g per serving. Obviously “platinum” is better than “gold” so must live up to its name by providing more protein per serving, right? Hard to argue that 30 > 24. That’s 25% more! While true, an inspection of the scoops given in each product reveals a classic marketing gimmick – different serving sizes, and as the photo below reveals each comes with a very different scoop. While more concentrated, the added serving size is misleading… and also means that you’ll be spending more per serving for the more expensive forms. Note that recommended serving size is usually suggested as a “rounded scoop”, and given the flour-like consistency of concentrate, it’s much easier to pile the scoop high for concentrates than isolates or hydrolysates. So pile it on. 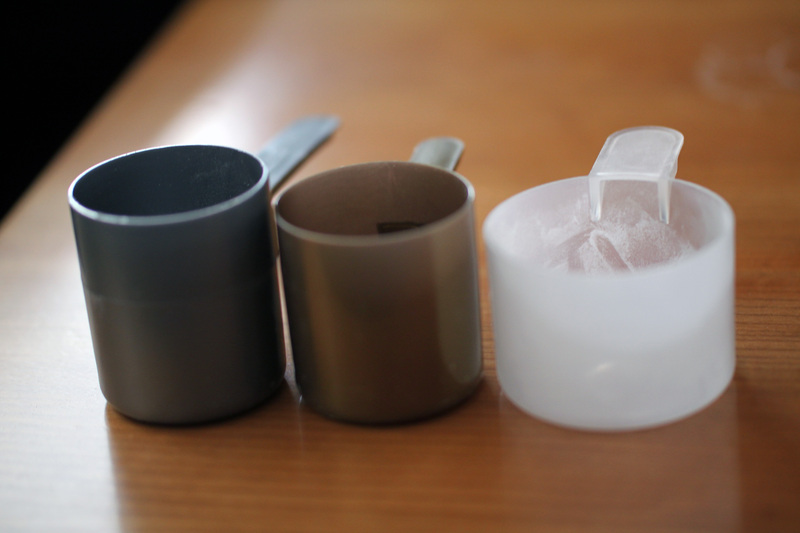 The low, wide scoop issued with the isolate (on the right) certainly makes it easier to round its more granular protein than the tall, narrow scoop (on the left) of the platinum hydrolysate, but you can just as easily determine your own serving size based on dietary goals – after all, this is FOOD, and as such you should treat it as any other part of your diet. I’ve tried “high quality” protein, and anecdotally haven’t experienced a difference. Since greater purity allows you to better regulate your intake (vs. other fillers and impurities), it’s sensible to prefer isolates to concentrates but not at any price. Many new bodybuilders are interested in mass gain requiring simply more calories, so the big issue is ingesting protein + calories, so purity is much less important. For those who have dietary sensitivities, go with the isolates… otherwise it probably doesn’t matter. Theoretically, hydrolyzed protein is absorbed more quickly, and theoretically that should speed recovery. That’s not an extraordinary claim, as processes to aid in chemical break down are well understood, as are digestion rates. The bigger question is if it matters. The answer is “maybe” but probably not unless you’re a super-elite athlete, and definitely not for the significant price premium. For us normal humans the most important thing is to get enough protein. I generally buy among the cheapest, purest protein powder (with few other additives or supplements) in bulk (5 lbs.) over the internet. Sites like bodybuilding.com, GNC.com, netrition.com, or marketplace providers on Amazon will routinely have sales and reasonable shipping costs. If you buy protein at specialty retail (Whole Foods, for example), expect to buy in smaller quantities and to pay more. I’m not picky about brand, so I generally purchase whatever is on sale that meets my criteria. That would be your fault. Eat it with your favorite beverage, fruit, yogurt… whatever you want. I usually buy a non-volatile flavor (vanilla) and mix it with fruit, yogurt, and juice in a bullet-like blender. If you don’t like the taste, add something you like until you like the flavor. Disclaimer: I don’t endorse any of the branded products or websites mentioned here. I’ve used/tried/bought from many of them and I haven’t been paid or received discounts from any. 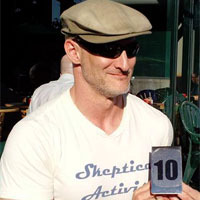 Jay Diamond is the founder of Reason4Reason – a skeptical activist group based in the San Francisco bay area. He holds dual masters degrees in engineering and business and has managed both startup companies and hundred-million-dollar programs for Fortune 50 companies. Growing up in Canada, he performed magic, studied science, and became aware of the skeptical movement. 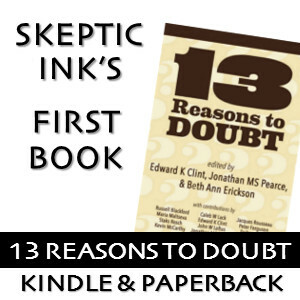 Jay has lectured around the world on science & technology, business, and skepticism. Is there solid empirical evidence that added protein to your diet builds muscle faster? Can’t our bodies convert other nutrients to protein? Protein gives the muscles what they need to repair themselves after a workout. But you still need other sources of calories (fats and carbs) or else you ain’t going to build anything but fatigue. Protein powders just provide a simple way to get fast absorbing proteins into your system so they can start doing their job. I think I’ll try protein bars for lunch. Whatever happened to meat and eggs? For that matter, there’s plenty of whey in cottage cheese. If you read my previous blog entry “A Skeptical Introduction to Supplements”, I detail how a normal diet doesn’t yield enough protein to build serious muscle. You’d need 2 dozen eggs/day, for example. 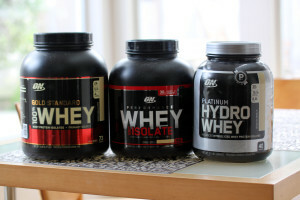 As per your previous blog post, I talk about my use of whey protein. In Australia, they list the amount of protein as measured amount per 100 grams. ie. at 100 grams, the protein may make up 70 grams there of, giving then a rating of 70% protein per 100 grams. This makes it easier to workout the real percentage of protein vs carb and other trace nutrients. Another thing to take into account, is that the body will recover quicker and build more muscle with a certain level of carbs and protein. Taking BOTH is recommended to build and maintain mass, and get growth. A recent study, http://www.ncbi.nlm.nih.gov/pubmed/23307404 , one of a few that are out there, finds that protein and carbs are the best way to get results with recovery, which is in it self a part of getting growth gains. All great points. The metric/imperial conversion issue presents problems for a lot of Americans (we somehow fought everything British EXCEPT the measurement system)… so my non-American friends reap benefits of simplified math. If I read the study abstract correctly (I haven’t read the complete study yet), it appears that they are claiming that ingesting carbs with whey isolate is optimal for obtaining the growth hormone response. That both makes sense and I practice it myself (fruit in my protein shake). IMHO (based purely on anecdotes), the dietary issue for most people trying to build muscle is NOT that they aren’t getting enough carbs… its that they aren’t getting NEARLY enough protein. Hence my emphasis in this article. In “A Skeptical Introduction to Bodybuilding Supplements”, I talk about the need for a balanced diet… no question that should be implemented before any supplements. Thanks for posting the study – I hadn’t seen it and I love to see high-quality evidence! I’ve been getting my life changed and healthy again. Quit smoking altogether, and drinking for the most part. Doing this created an eating monster. So I cut bread and sweets, and blah blah. I’m curious if, for someone like me, who is a month into P90X3–which isn’t real heavy into weight-lifting, per se–should consider whey supplements (sorry if you’ve discussed this in a previous post)? I’m honestly quite confused, because I’m trying to get into the best shape of my life and get rid of this lower-belly fat (I call it my beer belly), so I’m not sure whether I should be taking in so much protein if I want to burn that fat? If you read my earlier blog “A Skeptical Introduction to Bodybuilding Supplements”, I discuss why protein is the supplement with which you should start (and probably finish). P90X is both cardio and resistance training. You’ll definitely build muscle if you stick with it, and having the right building blocks (esp. sufficient protein) in the right amount should yield results. I finished P90X and have just started Body Beast, a program that is also from Beach Body, but with a focus on weight training. The protein has been a huge success for me (and I’ve also increased my caloric intake by a lot now that I’m focused on building mass), but I was wondering what your thoughts were on additional supplementation like creatine? blender. So far, so good. of the better articles of my admittedly limited research.